Students at work and at play. 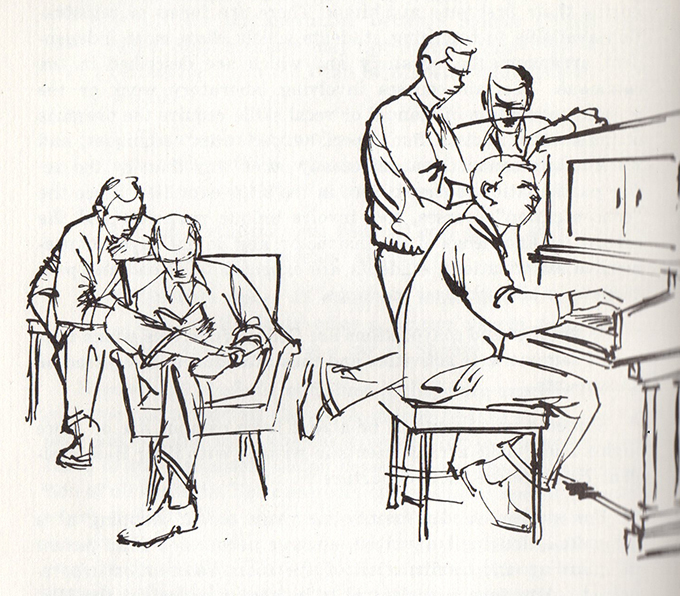 From the 1960 Shimer College student handbook. Wikimedia Commons. Here are a few things we all know to be true. The liberal arts and liberal education are in peril and require defending. The liberal arts are useful, but no one will say it. The liberal arts, defined loosely as something that is neither STEM nor vocational training, are relevant, necessary for the job of life, but need to be repackaged and loosened from the death grip of academics. Academics are afraid of change, the real world, and spend their time doing stupid tasks—slaves, depending on whom you ask, to critical theory or to tedious scholarly endeavors. They are all, in this story, Middlemarch’s Edward Casaubon, except some of them also hate white men. We know these things to be true because they are told to us by the many, many professional defenders of liberal arts education. “How can liberal education be saved? By becoming truly, enduringly useful,” says Damon Linker at The Week. Liberal education teaches you how to write, speak, and learn, says Fareed Zakaria’s In Defense of Liberal Education. Writing back in 2008, Alain de Botton dreamed a dream of a useful liberal education: “I dream of an ideal new sort of institution which could welcome Montaigne, or indeed Nietzsche, Goethe, or Kierkegaard—a University of Life that would give students the tools to master their lives through the study of culture rather than using culture just for the sake of passing an exam.” Then he made this dream a terrible reality. Each of these writers is a voice crying out in the wilderness, but apparently remains unable to hear all of the others. But their appeals to the language of usefulness and of work are not as rare as they think. Very few people would argue that a liberal education is valuable because it is useless. So they are really affirming a fairly popular view. More curious, however, is that none of these defenders of the liberal arts appears to look at a pamphlet or an advertisement produced by a marketing campaign at a college. Every one of these I have ever seen emphasize precisely the sort of things that the above defenders of liberal education view as necessary. The usefulness of a liberal education is everywhere proclaimed. Yet, the liberal arts are still in peril. One is tempted to think their advice is not very good. There's another possibility, of course: Is liberal education in peril, or is this danger, to some extent, manufactured? The dangers liberal education faces are probably not from the unsympathetic parents and children evaluating different majors, but from administrators and reformers for whom crisis is an opportunity to increase their ranks and stake their reputations. And if it is, much of the damage has already been done. Doubling down on utility also means doubling down on the problem. In “What is Liberal Education?” (1876) the then–president of Harvard, Charles William Eliot, argued that the term was both already meaningless—it could be expanded to include any subject that he wished to include—and needed to be expanded in order to secure the sympathies of the professional class in America, many of whom had not received “liberal education.” Liberal education, Eliot claimed, was a “magic circle”—its contents historically contingent, its prestige arbitrarily bestowed. It was a marketing term. It is still a marketing term, but it no longer works, perhaps because the magic circle was expanded to contain too much. Eliot’s track record, judged in hindsight, was pretty poor. In his work as a public intellectual, he represented the easy interests and aspirations of his class and little else. His judgment of the work of Harvard's faculty was not strong; he had a particular hatred of the philosopher George Santayana ("he does not dig ditches, or lay bricks, or write school-books, his product is not the ordinary useful, though humble, kind"). His vision of education, however, seems to be here to stay. But since Eliot, the concept of liberal education has steadily lost even the appearance of having a meaning. Indeed, for some, “liberal education” is defined by its lack of content. Fareed Zakaria believes fervently in openness; to him, a core curriculum of study (for instance) is almost opposed to liberal education. For others, liberal education is defined by loose “great books” touchstones and shared core texts: What will become of Plato? And for a few, liberal education is mostly defined by hostility toward mathematics (which is, for the record, itself a liberal art). If we try to prove the utility of this undefined concept, we are struck with the many fields of study that are just as useless. As Eliot said of Santayana, a useful kind of study digs ditches and lays bricks; it builds better technologies, makes our lives more comfortable, or extends our lifespan. So what is useful? The answer is: not much. Pure mathematics has no place in a scheme of education that is about utility. Neither do the observational sciences, which are—despite being of great importance in the history of science—politely shown the door in pop accounts of the discipline. The fine arts, which have always depended on patronage for survival, will never be able to justify themselves on the grounds of utility. Even fields of medicine which cannot promise quick results or which are only dubiously profitable will have—and do have—trouble surviving in this kind of climate. So none of these things are useful, in the immediate "what does this contribute" sense of the word. Usefulness, it turns out, is a measure that will destroy a lot of things. And maybe it will, in fact, destroy all these things. That would be bad; but it cannot really be prevented by pretending they are useful. The counter-argument that I usually encounter here goes like this: You have to make the argument that appeals to others, not the argument that is the most rigorous. If people like being useful, make them feel useful. But once bad arguments stop working, they begin to do damage. Eliot's argument for making "liberal arts" a more inclusive term was really an attempt to borrow prestige. But the prestige is now gone. We are left with the consequences of his argument: a claim to a particular kind of ditch-digging usefulness that, in the ordinary course of things, liberal education would probably not have made for itself. In this instance, however, we do not have to make sacrifices for short-term gains. Nobody really believes the bad arguments, no matter how many times somebody makes the case for them (or how many times someone is willing to buy Fareed Zakaria’s book). What arguments should be made? I have my opinions, but I do not expect many defenders of liberal education to join me in the embrace of uselessness. Nor do I expect them to reject Eliot's broader reforms. However, I would suggest that they do begin, not only by settling on , but by embracing the work that academics actually do in the disciplines they seem to support, and embracing that work in its particularity. The future of Plato rests not with the university's marketing consultants, but with the classicists who are tasked with and trained to continue to produce critical editions of his work. As the field of classics shrinks, so too do the people trained to do this work. This has consequences: Oxford University has begun crowdsourcing transcriptions of papyri. What was useful work for young classicists will be increasingly farmed out to enthusiastic hobbyists. For transcriptions, this is probably not so bad. But enthusiastic hobbyists may also be willing to take on other kinds of work they aren't really suited to do—such as commentaries, putting together critical editions, and translation. In defending everything but the actual work involved in a classics degree, the work of classics has become invisible. Classics is useful—for doing the work of classics. That is what it is supposed to do. In the long run, the classics majors who have suitably landed white-collar employment don't really matter. "You can make a sneaker equally well in many parts of the world," writes Zakaria. "But you can't sell it for three hundred dollars unless you have built a story around it." That is a case for something—you can call it liberal education. But with defenses like these, no one needs enemies. As I was putting the final revisions on this piece yesterday, I saw that Megan McArdle of Bloomberg has pointed out that no one needs Shakespeare. In fact (she points out) it may be that no one needs to "teach any writers at all." "Why are we putting this clear majority of the American people through something they find so distasteful?" Good question! But will it get good answers? B.D. McClay is associate editor of The Hedgehog Review.